Who is the Level 3 18th edition qualification for? This Level 3 18th edition course is a new course which will replace 17th edition course. After 31st December 2018 all electrical installations are to comply with BS 7671:2018. The course will last 3 days plus possibly an extra day for the exam (informed on first day of the course) and is all theoretical learning in a classroom. There is 8 units to study, 7 relate to the parts and 1 to the appendices of the BS7671 IET regulations. You will be assessed by an open book online exam in our training centre. 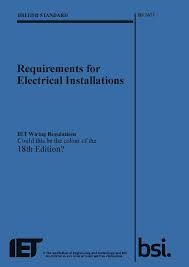 You are required to purchase a copy of the Blue version of the IET Wiring Regulations BS7671:2018 before attending the course. Why do you need the Level 3 18th edition qualification? What are some of the changes in the 18th Edition? Totally new Appendix to 18th Edition: Energy efficiency!